When we were working out the schedule for Nick’s articles last year, it was decided that we would publish his travels in Sulawesi in the New Year. Shortly after our meeting, the island was to suffer catastrophic damage following an earthquake and then a tsunami and we had to make the decision as to whether to stick to our schedule or rearrange. As Nick’s article predicted, in line with mainstream scientific thinking, the fate of the island should it be struck by such a disaster it was decided that we would go ahead as planned. 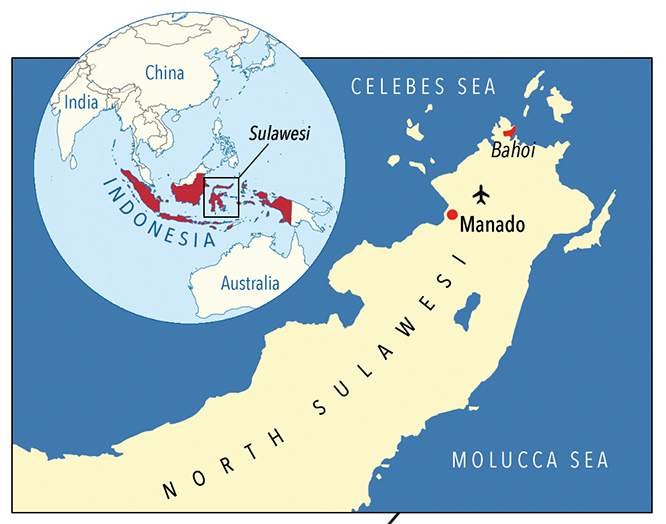 If you live in Swansea it will take you more than 24 hours to travel the 7,790 miles to Indonesia’s Manado airport on the island of Sulawesi in the lonely reaches of Indonesia. You will have flown twice the radius of Planet Earth and will have crossed so many time zones that you simply stop counting them. At least, in my catatonic jet-lagged state, I did. Stay airborne for much longer and you’ll find yourself coming back, because you really are heading for the far side of the world. But the distance isn’t half so mind-boggling as the sheer remoteness of this equatorial outpost. 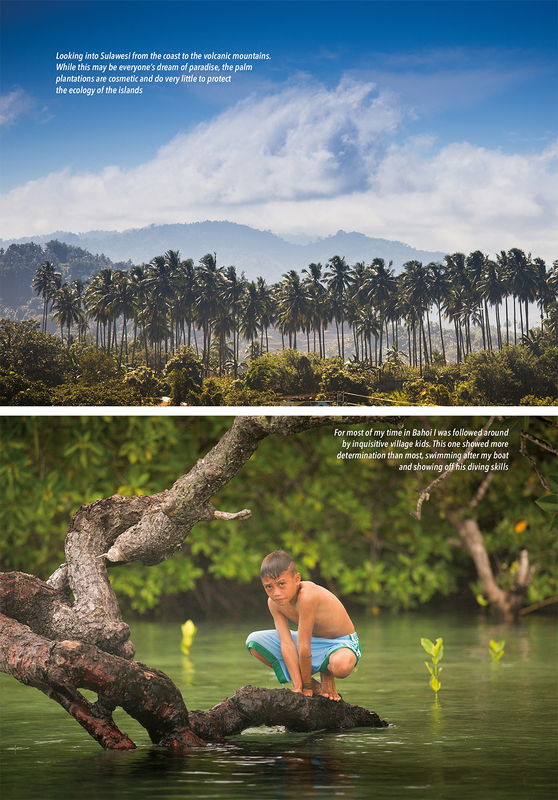 If you think that Sulawesi is far-flung, wait until you get off that island’s beaten track. We’re heading for the tiny fishing village of Bahoi to the north, and after hours of hacking along in an all-terrain vehicle, the middle of nowhere seems positively metropolitan by comparison. A place this cut off from the rest of the world should be pristine. On looking at photographs of popular Indonesian holiday destinations (such as Bali, Sumatra and Java) in glossy travel magazines you’d be forgiven for thinking that, of all places you could visit, this archipelago of thousands of emerald green volcanic islands set in inky blue water is heaven on earth. But it’s not, because despite the old adage that ‘the camera never lies’, the people who use them are perfectly capable of bending the truth and, when it comes to selling luxury travel experiences, seem to do so with breathtaking nonchalance. And so while Indonesia’s coast may appear to the armchair explorer as paradise, if anything it’s more like paradise lost. All along Indonesia’s coastline the coral is dying, mangroves are receding and fish stocks are being run down. Tons of plastic dumped into the ocean by commercial shipping washes up on the shores with every tide. What’s happening to this fragile ecosystem is a huge man-made disaster and no one in a position of authority is doing much about it. Lack of money, scientific understanding and political will have conspired to thwart any attempt to repair the damage. Why does it matter? I’m off to Sulawesi to find out. We can pretend that it isn’t, but Indonesia is choking in plastic, while being beaten to death by heavy shipping and drowning in indifference. On the bright side, there are sometimes chinks of light in the darkness of our short-term insanity. There is a handful of rare people prepared to stand up and shout at the movers and shakers that, when it comes to protecting the environment, don’t do much moving or shaking to speak of, because environmental protection doesn’t bring votes with it. 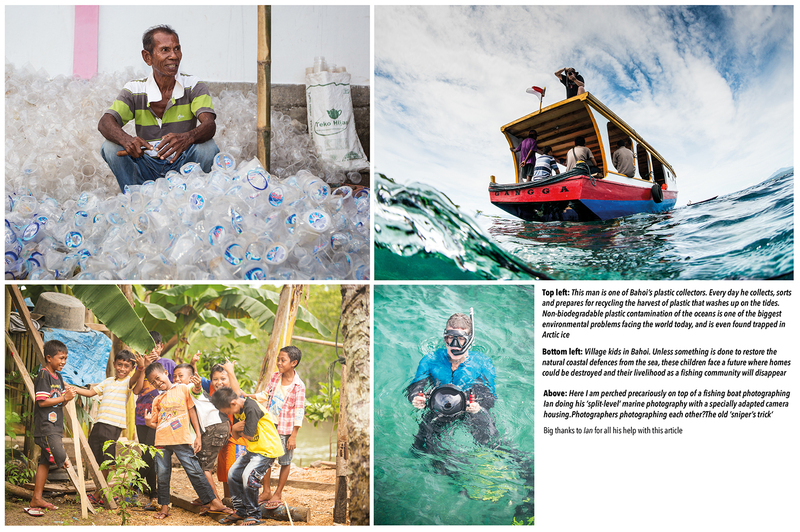 Among the leading lights in this small but very loud group is Yann Arthus-Bertrand, arguably the world’s most famous photographer, and a man on a mission to bring the plight of Indonesia’s coast to the world’s attention. And so on an assignment of a slightly different nature to what I’m used to, I was sent by The Times newspaper as a writer to cover the Frenchman’s pioneering conservation work in Bahoi. Yann has ambitious plans to help clear the water of plastic, to make fishing sustainable once more and to revitalise the regrowth of the vital coastal mangroves. Since my fee from The Times barely covered my expenses, to make the travel and time spent in the field worth my while financially I decided to pitch the story to a fancy London lifestyle magazine in the hope that I could push my expedition into profit. Luckily, my editor at Kensington & Chelsea was sympathetic to the idea that sometimes travel reporting has a serious side to it and told me to go ahead, only I’d need to take photos too. “Not sure I can do that,” came my reply. “You see Yann will have an official photographer with him. I don’t want to tread on anyone’s toes.” After a moment, she ventured the opinion that she didn’t want to publish “generic pictures that will be in every newspaper in town. Take your camera and come back with some of your own for my exclusive use.” Otherwise, no deal. Leave it to me, I said doubtfully. Sitting on a jetty, watching the fishermen prepare to go out be-yond the mangroves in their brightly painted boats, I introduce myself to Yann, and I ask him why he has become so heavily involved in global green politics. After all, as a seventy-something grandfather with a glamorous career at the top of the photographic tree, doesn’t this all see a bit like, well, hard work? Isn’t saving our planet for young eco-warriors? “It’s not our planet,” says Yann. “It’s our children’s planet. As a species, my generation of humans is show-ing it no respect at all. It’s embarrassing to think that we care so little for the planet we live on that we can kill all of the wildlife, poison the water and pollute the air as if it didn’t matter: as if there were no consequences.” I have to admit that I like Yann’s style. It’s said that Yann’s a difficult man to work with because he has little time for idiots, and is possessed of a fiery Gallic temper that won’t stay in the holster if it needs to come out. While his influence is at governmental level, and he can get in the room with Presidents and Prime Ministers, he doesn’t like having to deal with the sort of self-serving ‘greenwash’ routinely dished out by politicians, and is often extremely abrupt with them. And why not? 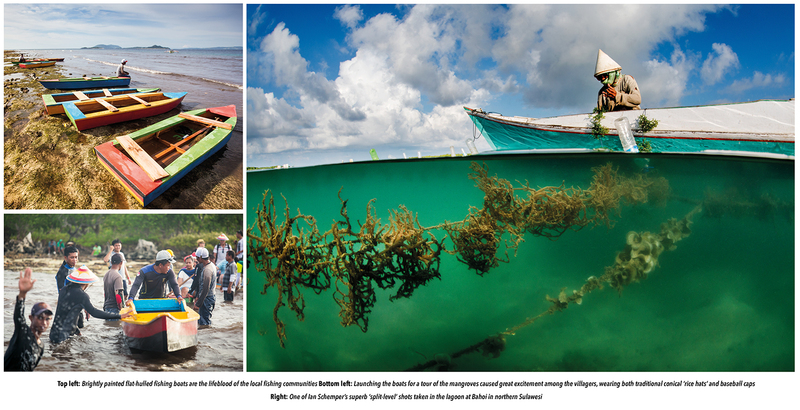 The plight of Indonesia’s coastline is an environmental tragedy of epic proportions. 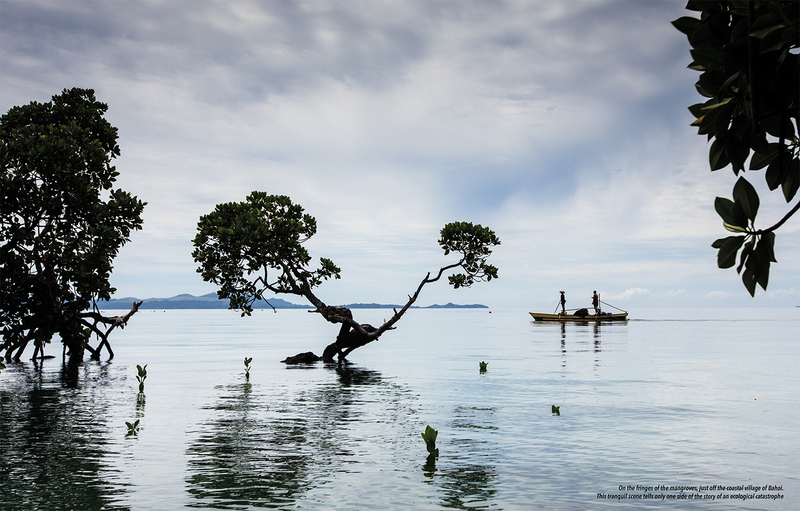 Three-quarters of Indonesia’s mangrove swamps have been damaged by shrimp fishing. The coral reefs that provide protection for the coastline are dying due to pollution and heavy shipping. There’s plastic everywhere. It’s a time bomb with far-reaching effects for future generations of fishing communities that live on the coast. Yann hopes that his efforts via his GoodPlanet Foundation will start the ball rolling in the restoration of the delicate coastal coral and mangrove ecosystems. He hands me his business card: try as I might I can’t find the word ‘photographer’ on it. Instead, it describes him as a United Nations Environment Programme (UNEP) ‘goodwill ambassador’. On one of those sweltering, muggy overcast mornings that you always seem to have in the Far East, we get to work, Yann leading the way, Ian photographing Yann, with me trying to stay out of everyone’s way. But before long, Ian needs to do some underwater product shots for Omega and he disappears to put on his wetsuit and fins. Meanwhile, I head off into the mangroves with Yann, who gives me a tour, pointing out the destruction and restoration in equal measure, describing both in a mixture of French and English. 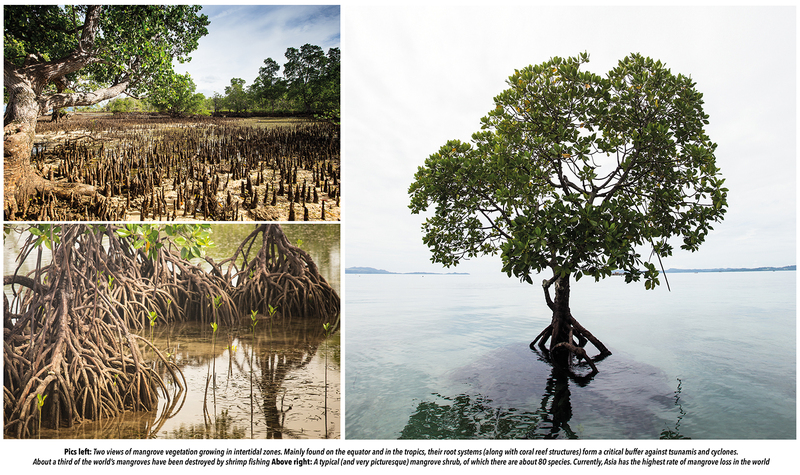 He explains that the need to protect the mangroves is pressing, not just because it is a rare ecosystem: “It also protects coastal villages from surges caused by shipping. If we lose this natural defence, when the next tsunami comes, the effects will be even worse. We all meet up for lunch and I ask Ian if I can spend a few hours watching him work. You can read books and go on courses, but the only real way to learn how to take better photographs is to observe a master craftsman at work. That’s because operating a camera is easy, but taking decent photographs is difficult. Despite having more on-board computing power than the entire Apollo 11 space mission, today’s camera is still just a box for capturing controlled amounts of light onto a photographic substrate, and we’ve known that since the time of Leonardo da Vinci. But that’s just the start of the journey, because it’s all about what you do with your camera. And I want to see what Ian – whose photographs are uniformly superb – does with his. Ian readily agrees, especially as he’d like some photographs taken of him working. “My wife thinks what I do is easy. I’d like to show her just how tough it can be.” Good luck with that, I thought. There’s no way you’re going to be able to convince anybody that flying to the other side of the world is a tough gig. True, it can be extremely demanding at times but, once you get over the fact that you’ll never get over your jetlag, it can be a lot of fun. In this instance the fun takes the form of crouching high on the roof of a flat-topped fishing boat pitching heavily in open water. The idea is for me to photograph Ian creating his trademark ‘split-level’ shots, where the final image is framed half-in and half-out of the water. 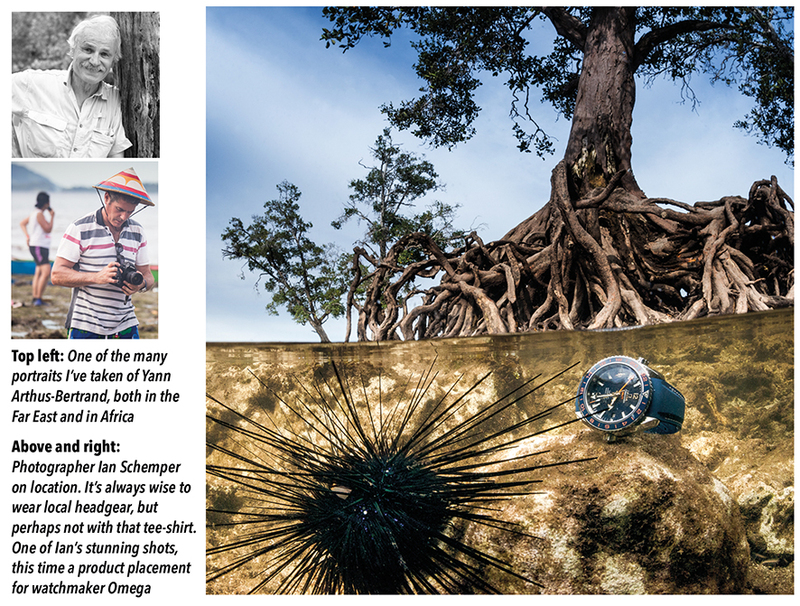 To do this, he uses a specialist acrylic dome housing for his camera and it’s all very complicated, requiring excellent snorkeling skills on top of all the usual understanding of light and composition. Coming up for air, he does what photographers call the ‘sniper’s trick’ in which he shoots me shooting him. After which, I leave him to it. I need to talk to the villagers, who tell me about how they harvest the plastic every morning from the shore and how both village life, and the fishing on which they depend, has improved since Yann’s organisation got involved and started to give their families a sustainable future. As we take final hike around Bahoi, Yann tells me that if we can start to repair this stretch of coast, then others will follow his example. “Maybe even governments will get involved too. The projects will join up. Nobody will lose, because when the system is in balance there will be room for responsible tourism that will bring in more money to do yet more good work on Indonesia’s coastline.” It will be, he tells me, a self-fulfilling prophecy. As we start the long trek back to the UK, I ask Yann if there are enough people out there who want to make this happen. “I think that there are,” he says.